In my mission to read all the nominees for the 2014 Silver Birch Fiction Award from the Ontario Library Association, so far I’ve managed to read 7 out of the 10 books. If you’re interested in what I have to say about them, these are the ones I’ve read: Eldritch Manor by Kim Thompson, Nobody's Dog by Ria Voros, Ultra by David Carroll, The Curse of the Dream Witch by Allan Stratton, The Hypnotists by Gordon Korman and Record Breaker by Robin Stevenson. Thirteen-year-old Meredith yearns to become a teacher but must leave school to help support her family. To find the best paying job for a young girl of her class, she travels to the city to work as household help in a doctor’s home. From the start, her life is made difficult by the cantankerous and prickly butler, and confrontations with Maggie, the doctor’s spoiled thirteen-year-old daughter. As the deadly Spanish Flu sweeps across the city, members of the household fall ill one by one. With the doctor working night and day at the hospital, only Meredith, Maggie, and Jack, Maggie's handsome older brother, are left to care for them. Every day the newspapers’ lists of “Yesterday’s Dead” add to Meredith’s growing fears. This story hooked me from the beginning and held my attention all the way through. I was rooting for Meredith to make it through her struggles—first in coping with the difficult situation of leaving home to work and then in coping with the household and patients during the Spanish Flu. I didn’t know much about the Spanish Flu and its effects before, so it was interesting to learn about. As a writer, I admired how the author made me feel almost like I was living in 1918. The details of the time period unfolded naturally through the story. Pat Bourke lives in Toronto, Canada where she is working on her next book. She also works as a business editor. 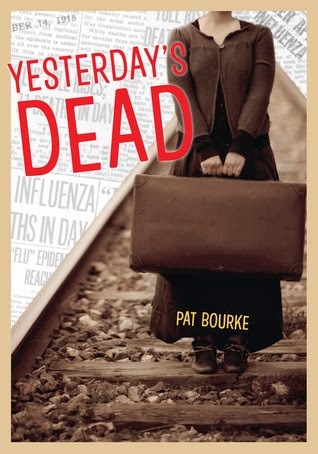 Yesterday’s Dead is her first published novel. For more, visit Pat Bourke’s website. You can find more Marvelous Middle Grade Monday books by checking out Shannon Messenger’s blog! Shannon is the founder of Marvelous Middle Grade Monday and the author of the middle grade novels, Keeper of the Lost Cities and Exile (Keeper of the Lost Cities #2). This week I'm taking a closer look at another one of the nominees for the 2014 Blue Spruce Award from the Ontario Library Association's Forest of Reading. Other nominees I've featured so far include Oddrey by Dave Whammond (OwlKids Books), I Dare You Not to Yawn by Helene Boudreau (Candlewick Press), A Good Trade by Alma Fullerton (Pajama Press) and Sky Color by Peter H. Reynolds (Candlewick Press). Willow is thrilled the whole class -- including her! -- is invited to classmate Kristabelle's fantastic birthday party, until the bossy birthday girl starts crossing guests off the list when they dare cross her. There are many books on bullying, but Willow's story offers a unique look at how to handle the situation as a bystander. I really liked the way this book captured situations that might happen to any child—and I loved Willow’s kid-friendly solution to the problem, showing one way of taking a stand. The cartoony style illustrations were cute and would appeal to children. I was pleased to find that this book addresses the issue of using a birthday invite to be unkind to others, because this often comes up in my classroom. This book would be a great way to start discussions about feelings, what it means to exclude others, how you can feel pressured to go along with a kid who is bossy or mean and what you could do about it. It’s a good book to include in a classroom or a collection of books about character education. Looking for other great picture books to use in your classroom or to read with your children? Check out these recommendations for Perfect Picture Books over at Susanna Leonard Hill's site. It's 1963, and Jack's family is still reeling from the SIDS death of his baby sister. Adrift in his own life, Jack is convinced that setting a world record will bring his father back to his senses and his mother back to life. But world events, including President Kennedy's assassination, threaten to overshadow any record Jack tries to beat—from sausage eating to face slapping. Nothing works, and Jack is about to give up when a new friend suggests a different approach that involves listening to, not breaking, records. This is a touching story about a boy trying to cope with the sadness in his family after his baby sister’s death. It was easy to relate to Jack, trying different things to try to help his mom and his dad back to a point where they can be stronger family. It’s a fairly short, easy to read story that kept my attention all the way through. 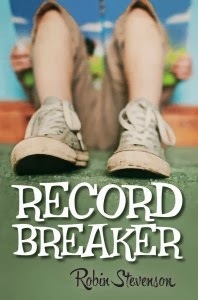 There are some funny parts to the story, especially what happens as Jack tries to break different world records. As a writer, I liked how the author wove in historical details from the time period of the story (1963). The writing style was straightforward with enough detail to give a good picture in my mind of what was happening. Robin Stevenson lives in British Columbia, Canada and loves to travel. She enjoyed writing when she was a child, but stopped in high school and then got interested again after her son was born. For more, visit Robin Stevenson's website. You can find more Marvelous Middle Grade Monday books by checking out Shannon Messenger’s blog! Shannon is the founder of Marvelous Middle Grade Monday and the author of the middle grade novels, Keeper of the Lost Cities and Exile(Keeper of the Lost Cities #2). This week I'm taking a closer look at one of the nominees for the 2014 Blue Spruce Award from the Ontario Library Association's Forest of Reading. Other nominees I've featured so far include Oddrey by Dave Whammond (OwlKids Books), I Dare You Not to Yawn by Helene Boudreau (Candlewick Press) and A Good Trade by Alma Fullerton (Pajama Press). Marisol loves to paint. So when her teacher asks her to help make a mural for the school library, she can’t wait to begin! But how can Marisol make a sky without blue paint? 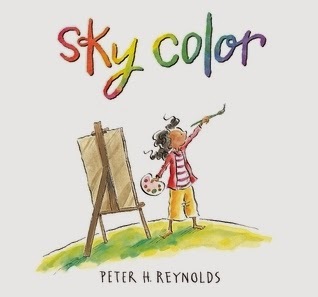 After gazing out the bus window and watching from her porch as day turns into night, she closes her eyes and starts to dream. . . . From the award-winning Peter H. Reynolds comes a gentle, playful reminder that if we keep our hearts open and look beyond the expected, creative inspiration will come. I liked how the story stuck with one clear story line and didn’t try to do too many things. It’s a good example for picture book writers who are struggling to learn how to tell their story in a small amount of space and words. The illustrations made the story come alive for me. I really enjoyed the way Mr. Reynolds drew attention to color, by creating illustrations in various shades of sepia except for the colors in the art. This book would be a great one to read along with an art lesson in mural-making, color mixing or to discuss how important it is to really observe the world around you to spark your creativity. It would be fun to read Peter Reynold’s other books in this series, The Dot and Ish, and to talk about similarities and differences and the underlying themes of risk-taking and creativity. I’ve decided to read all the nominees for the 2014 Silver Birch Award from the Ontario Library Association, but I might have picked this one anyway. I’ve enjoyed several of Gordon Korman’s series in the past, like Everest, Dive and Kidnapped, as well as last year’s Silver Birch nominee, Ungifted (featured on my blog here). Jackson Opus has always been persuasive, but he doesn't know that he's descended from the two most powerful hypnotist bloodlines on the planet. He's excited to be accepted into a special program at the Sentia Institute — but when he realizes he's in over his head, Jackson will have to find a way to use his powers to save his friends, his parents, and his government. The concept behind this book was a lot of fun, and the fast pace kept the story moving right up to the ending. Speaking of the ending, even though this storyline was wrapped up, there were a few unanswered questions to be explored in the next book. And the last line, “It was time to disappear off the face of the earth” really made me want to read it. This is a story where the main character confronts an evil villain and “saves the day” but with lots of twists and turns along the way. I enjoyed the voice and bits of humor sprinkled through the story. As a writer, I found it interesting that even though the author broke some writing “rules” such as using dialogue tags like “challenged”, “panted”, and “intoned”, on my first read through I barely noticed. I only realized after, when I was writing this post and thinking about quotes to pull out. It highlights for me how important it is to have a compelling and interesting story and not get hung up over thinking about “rules” of writing. Gordon Korman was born in Montreal, Canada and wrote his first book, This Can't be Happening at Macdonald Hall when he was 12 years old in grade 7. It was published when he was 14. 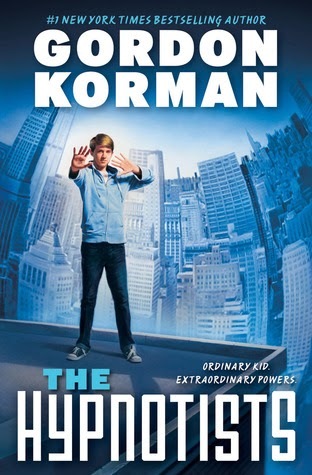 For more, visit Gordon Korman's website.